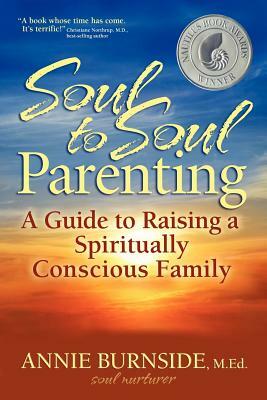 A guidebook for parents who want to infuse greater spiritual awareness into everyday life. SOUL TO SOUL PARENTING gives you the tools to lead an authentic, conscious, divinely inspired life so that you can provide the same for your children. Tap into your intuitive wisdom as together you explore universal spiritual principles through a variety of simple, daily means. - Opens up communication with 15 universal themes such as connectedness, boundaries, presence, openness, truth, perception, authenticity and joy. - Features 22 methods for integrating spirituality into family life, including visual cues, the spirit mobile, art, the intuitive-gratitude journal, nature and more - Includes thought-provoking parent contemplations, family activities and an extensive list of suggested books, music, and movies for all age levels. SOUL TO SOUL PARENTING assists parents in becoming active participants in their children's awakening as conscious global citizens. A key message for parents: Once a divine perspective is ignited within, we can feel more intimately connected to the eternal source, cultivating personal truth, authentic relationships, and enhanced life experiences.